In the midst of teaching my troublemaking graduate course this semester I came across a children’s book that looked really cool–The Book of Timeouts: A Mostly True History of the World’s Biggest Troublemakers by Deb Lucke. One huge impetus for my work on troublemaking as an ethical and political virtue is to reclaim it for kids (and adults) as something they should do and never stop doing. I want my daughter RJP to be valued for her amazing troublemaking spirit and I want others (her teachers, the shows that she watches, adult figures in her life, the books that she reads, peers) to recognize and encourage that behavior in her. Of course, I want that for my son FWA as well, but I don’t worry as much about him. As a lot of feminist theorizing has revealed, young girls are particularly discouraged from talking back, speaking out and challenging the rules. To varying degrees, they are often punished more harshly for their improper acts than their male counterparts. Now, I am not talking about troublemaking as violent, disruptive outbursts in class or Bart Simpson-like pranks that are perpetrated to create chaos and destruction (and to repeatedly shame the already beaten-down Principal Skinner). Continuing the Simpson analogy, I am talking about the Lisa Simpson version of troublemaking: the critical thinker who refuses to accept her teacher’s lectures as gospel and who is able to cut through the crap and uncover difficult truths about the larger structures that shape her and dictate how she is supposed to behave (I need to return to this image of Lisa Simpson as a virtuous troublemaker in another blog. What I don’t like about her critical thinking-as-troublemaking is how serious she is. She needs to lighten up and find the fun in challenging the system. Personally, I find her to be a little too self-righteous). 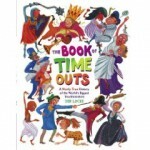 But, let’s get back to the subject of this blog entry: The Book of Timeouts. So, as I mentioned above, I was really excited to find out about this book. At last, a children’s book that valued troublemaking and offered a history of how famous historical figures have engaged in troublemaking in valuable ways! The blurb on the back cover seemed to encourage the reader to really think about how troublemaking has been used to make history (and not just in destructive ways): “The next time you get a time out, take this book and read about the most famous and infamous rabble-rousers in history…”. For as long as there have been people, there have been people who were badly behaved, out of line, out of order, ill-mannered, inappropriate, or just plan unwilling to follow the rules. Preach it sister! Okay, some rules might be important to follow (like red=stop and green=go or look both ways before crossing the street). But, when the rules become rigid roles of how little girls should behave (like “proper,” dainty, pretty and unthinking dolls) or mandates on what it means to be patriotic (not to question motives for entering war) or laws about whose love should be recognized and whose shouldn’t, well, then those rules should be questioned and maybe even broken. In those instances when those damaging rules are forced upon us, we need to behave badly. We need to be out of line or cross the line or eliminate the line. And, to engage in all of this rule breaking, we need to have instructive models for how to do it effectively. We need to be trained in ethically and politically responsible troublemaking practices that allow for social transformation and not just destruction. That do more good than harm. Since you’re reading this book perhaps you too have, on occasion, been less than perfect. Maybe you woke up feeling full of yourself and like doing whatever you wanted. You got more and more out of control. Finally someone like your mom noticed and said, “You need a time out!” …If so, you’re not the first to have a time out, you’re not the worst. And this is where the book goes all wrong for me. I see two big problems with this introduction (I will devote the rest of this entry to the first of these problems and take on the other problem later). By linking little kids’ temper tantrums with adult acts of rebellion, Lucke ends up lumping all forms of troublemaking together in her description. This flattens out the important differences that exist between specific forms of troublemaking and leads to the equating of little Johnny refusing to eat his vegetables or sit quietly at the dinner table with Susan B. Anthony refusing to be denied the right to vote or Rosa Parks refusing to sit at the back of the bus (Yep, these are examples in the book. Perhaps the only two examples of good troublemaking). Whaaa? What are kids supposed to make of that connection? Sure, as a mother of two young (3 and 6) kids, I am not interested in encouraging my kids to be crazy hellions who do whatever they want whenever they want. There should be limits to their behavior, but limits not based on what is Proper or Right, but on how their actions affect themselves and others. The best forms of troublemaking are aimed at transforming the world for entire communities and are always done with an awareness of how our actions impact others. Susan B. Anthony didn’t break the rules because she got up on the wrong side of the bed or because she was feeling “full of herself.” She challenged the law that denied her the right to vote because she saw an injustice being done to her and to all other women in the United States. And, Rosa Parks didn’t refuse to sit at the back of the bus because she was out of control. She did it because she was well-trained in non-violent resistance and an active participant in the civil rights movement. And, she did it because she saw an opportunity both to challenge (for herself and for her community) a racist bus policy and to help mobilize a strike against the Montgomery Bus Company. I want my kids to know the difference between troublemaking that is selfish and not virtuous (the kind that involves going ape-s**t in Target and flinging themselves on the floor) and troublemaking that is aimed at a greater good and/or with others in mind (the kind that involves speaking up for another kid when a teacher or another student says something racist, sexist or heterosexist against that kid). I don’t want a kid’s book that encourages my kids to equate “bad” and punishable behavior with speaking up for themselves.